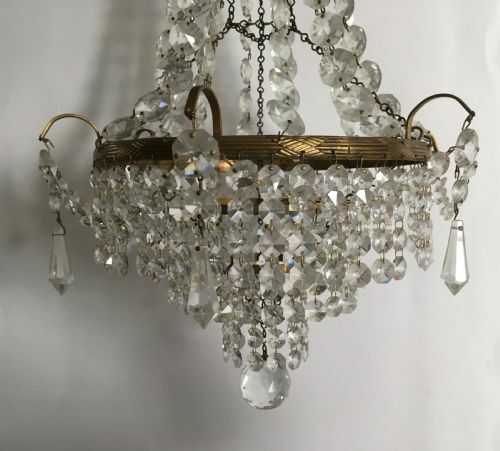 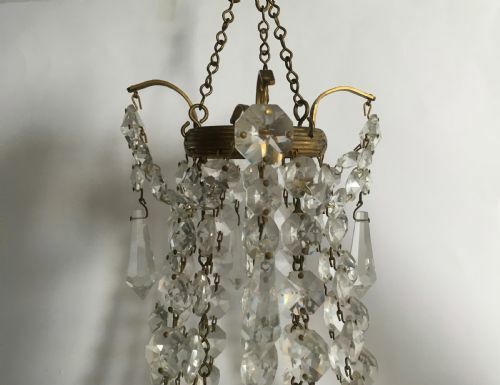 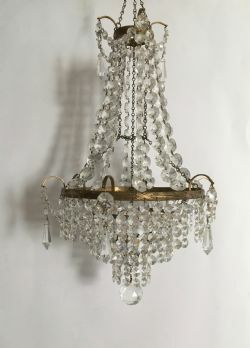 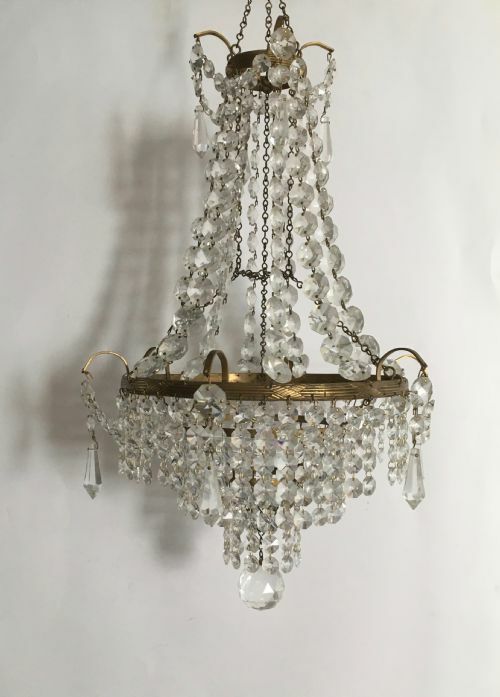 Early 20th Century pretty compact crystal chandelier, two brass rings with long drops at the top and 2 lower rings holding smaller crystal drops forming a purse base ending in a glass ball, surrounded at both levels with a string of crystals and diamond drops hanging from brass arms. 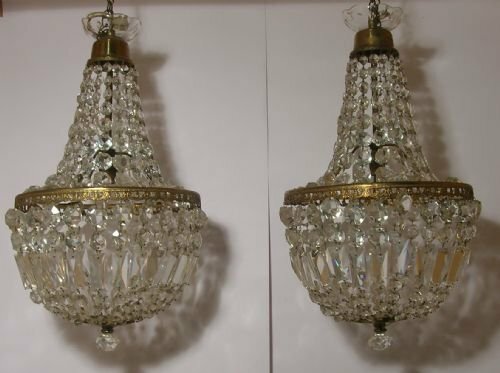 A strikingly attractive matched pair of crystal glass chandeliers, made in the mid 20th century and just removed from an apartment, cleaned and ready to hang. 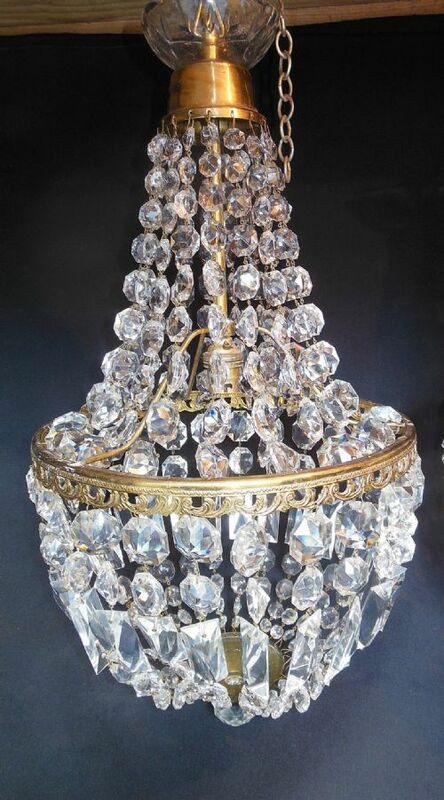 Topped by a glass bowl above a gilt brass bell top, cascading down to a central gilt brass ring, the purse crystals of faceted stones and bars terminate in a large round crystal at the base. 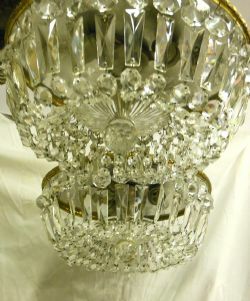 One has two small crystals missing from one of the strands but otherwise they are complete. 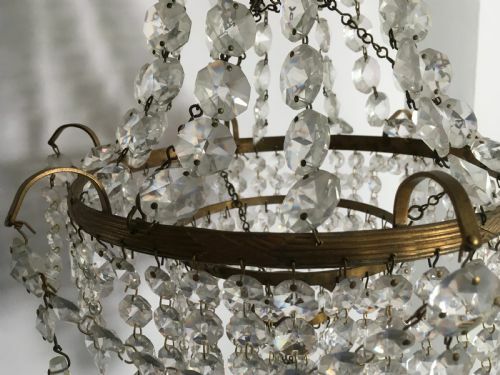 Drop from the ceiling to bowl adjustable depending on the length of the chain. 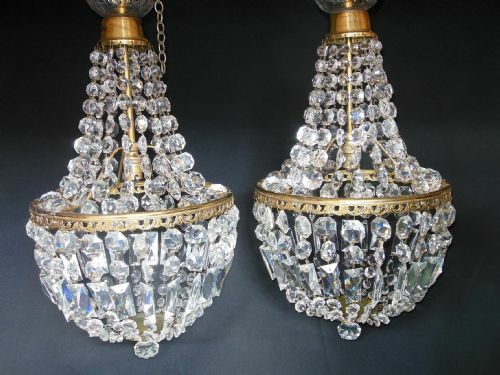 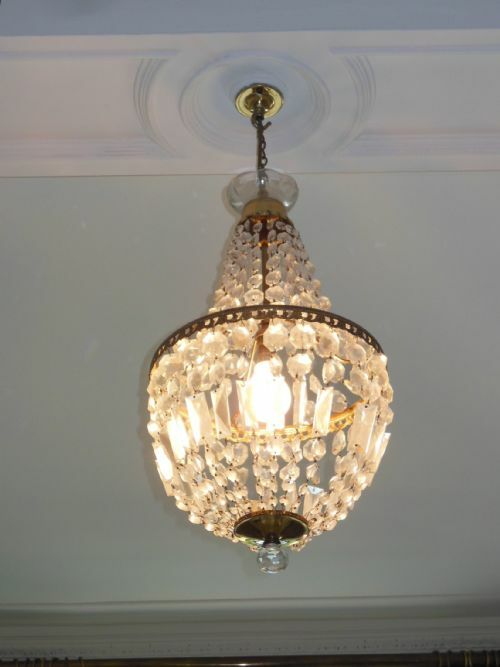 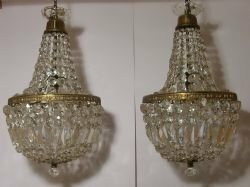 A strikingly attractive matched pair of crystal glass chandeliers, made in the 1920's or 30's and just removed from a house about to be refurbished, they will need to be rewired to conform with current standards. 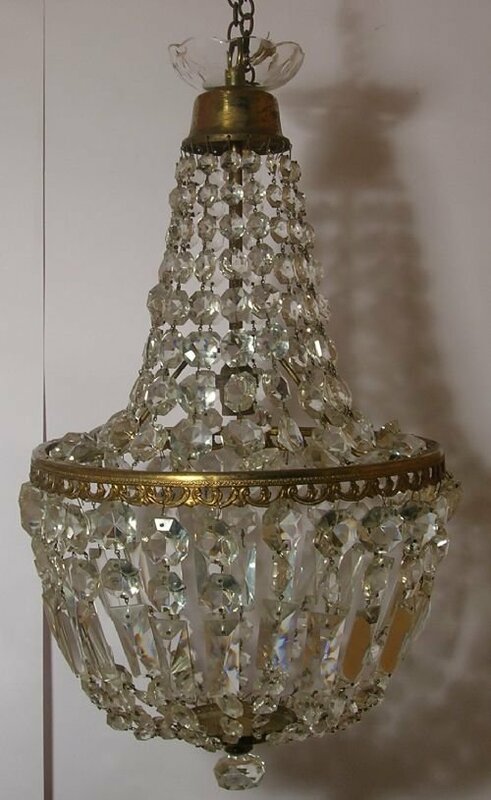 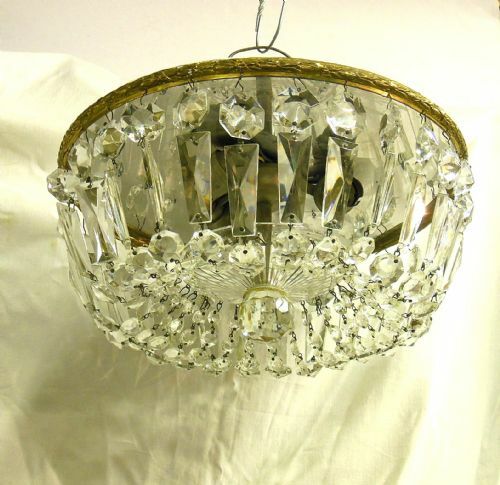 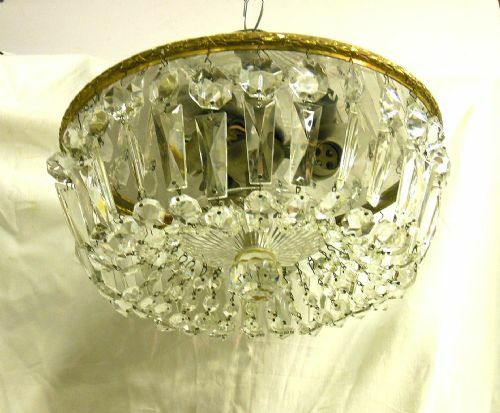 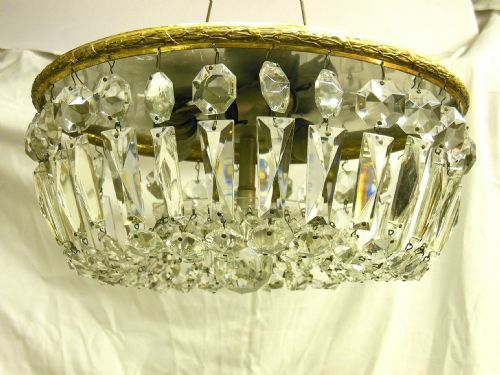 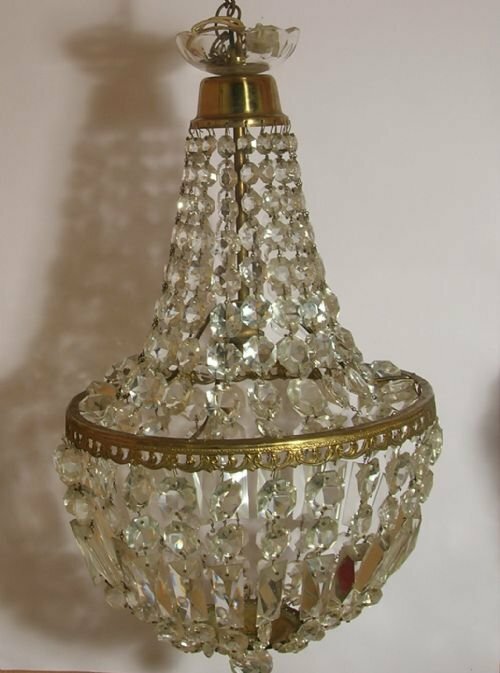 Topped by a glass bowl above a gilt brass bell top cascading down to a central gilt brass ring the purse crystals of faceted stones and bars terminate in a large round crystal at the base. 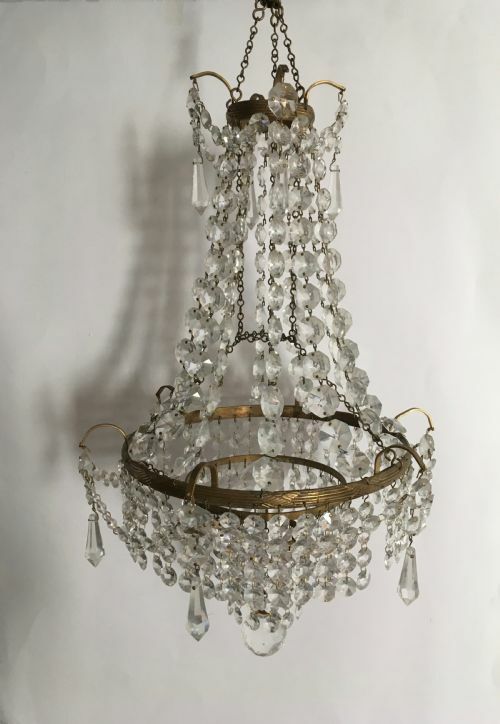 There are 2 strands missing from the top of one of them but not obvious and easily replaced. 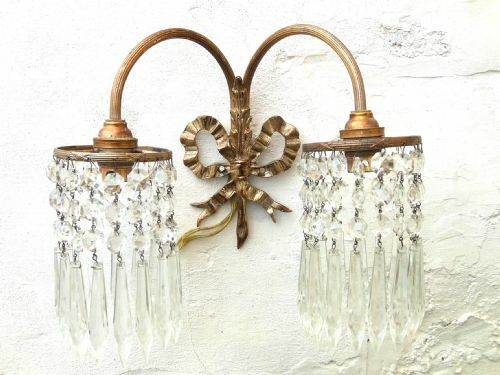 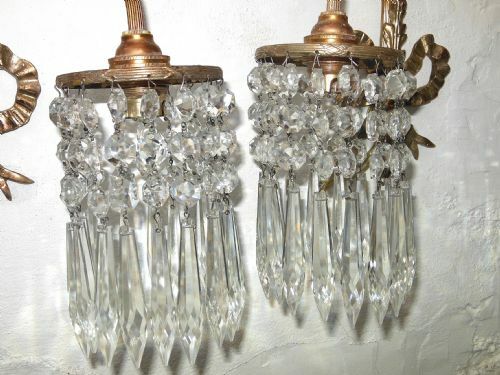 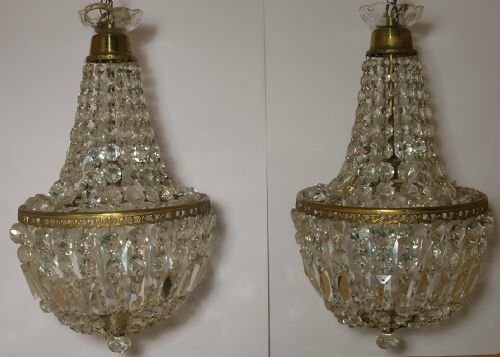 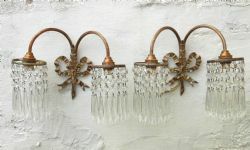 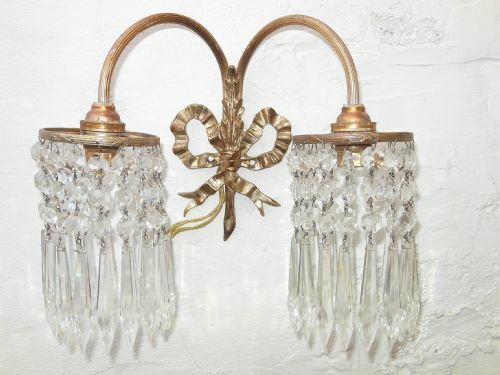 These gilt brass pair of wall lights with two arms and hanging crystal lustres have just been removed from an apartment, cleaned and are ready for a new home. 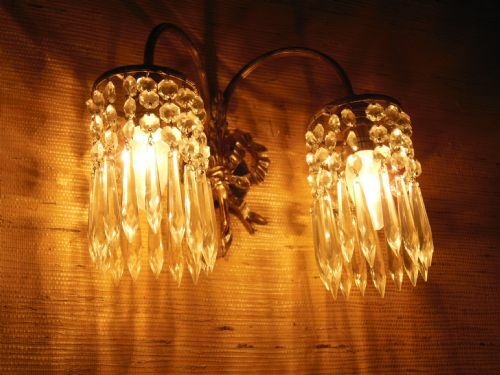 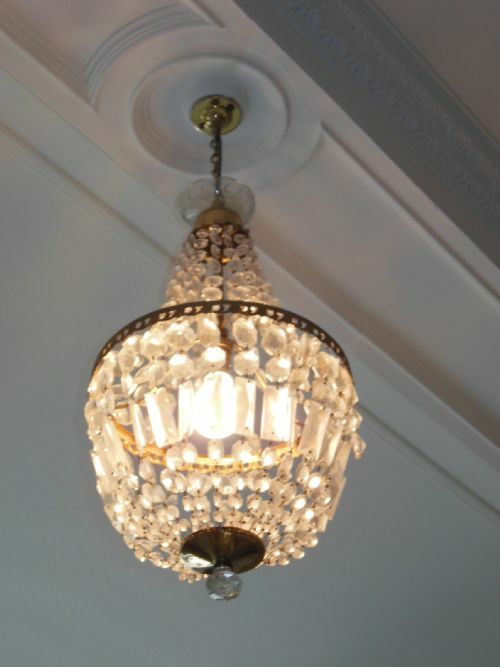 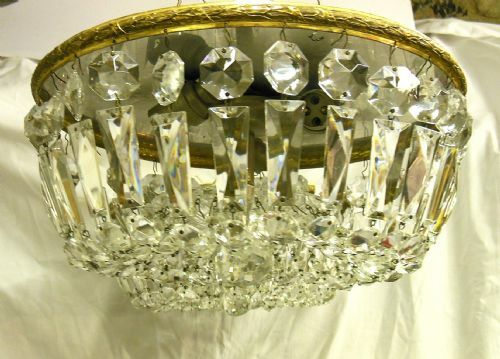 In addition there is another wall light, crescent shaped with crystal stones and bars. 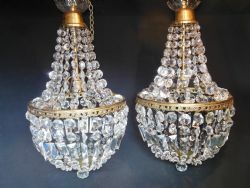 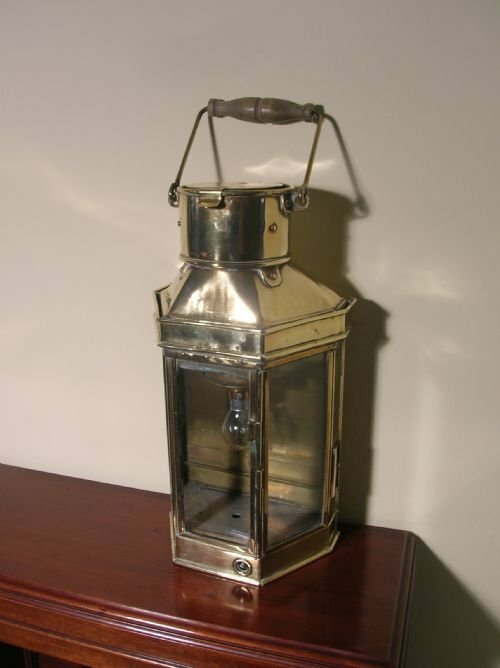 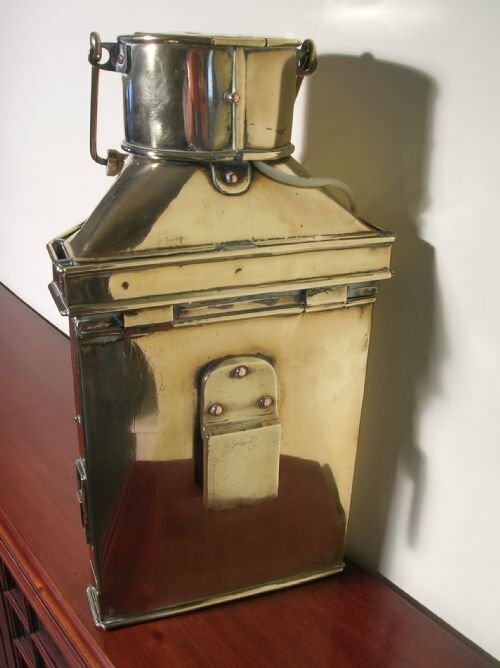 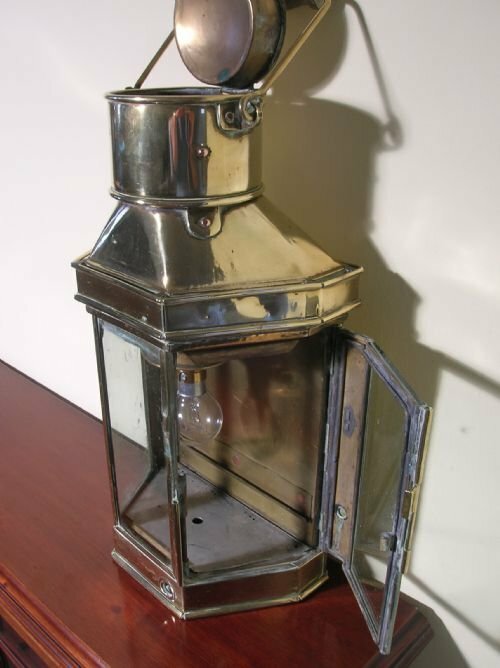 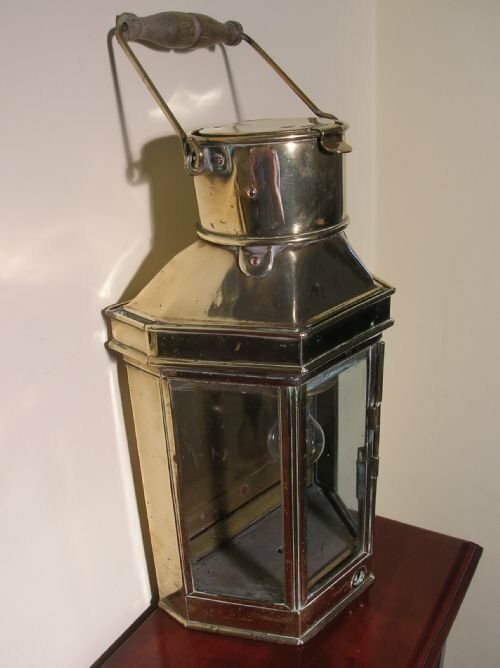 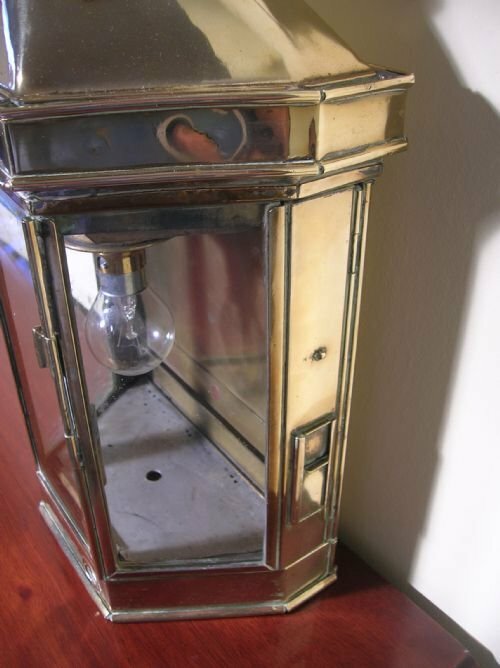 All made in the mid 20th century, they are in excellent condition. 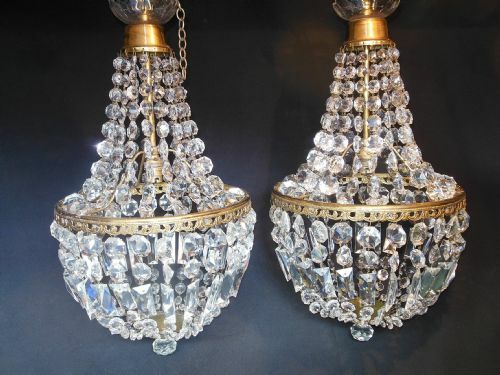 These crystal lustre lights with round stones and bars gathering to a centre plate and a round central stone have just been removed from an apartment, they have been cleaned and are ready for a new home.